To be strong like a mountain, to be stable like a tree but how do we find our inner balance, our stability? Standing in Tadasana - Mountain pose, spread the toes and root down through the feet, engage the kneecaps to lightly activate the thighs, tuck the tailbone to turn on the core muscles, drop the shoulder blades down the back, gaze between the eyebrows, crown of the head lifting up. Creating space in the body, feeling strong and stable - GROUNDED. In Tadasana we can feel a sense of balance and if we close our eyes for a moment we may even feel a sense of calm. We are firmly rooted on the earth and in Tadasana we can begin to explore this feeling of balance. What happens if we shift more weight into our left foot? How does this effect our posture? What happens if our core is relaxed and not engaged? We can explore this and begin to find our own individual sense of balance. 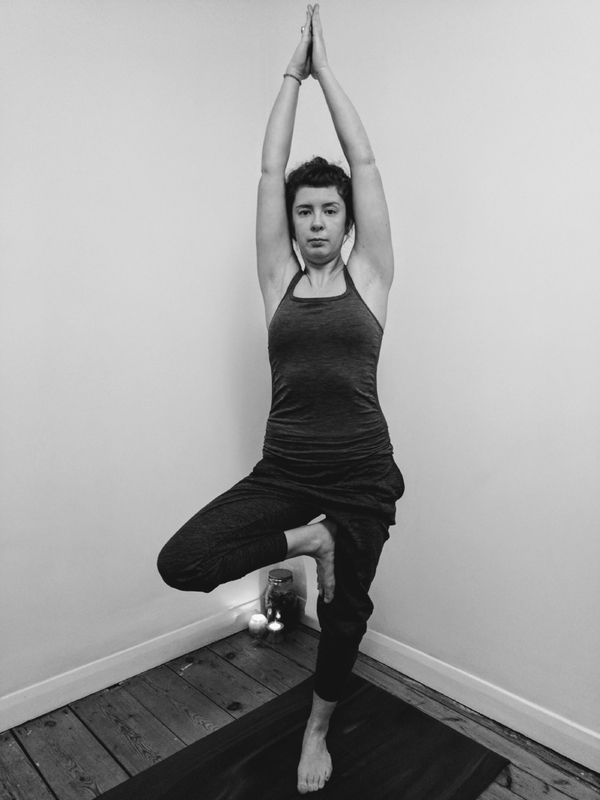 In Vrksasana we need to find our stable and upright alignment in our standing leg through Tadasana while working with a hip and inner thigh stretch of the lifted leg. The standing leg is like the roots of the tree, the stable pelvis carries energy from your roots up into the spine and torso creating a strong trunk. Arms reach up into the sky towards the sunlight. Just as a tree changes throughout the seasons to light and rain, wind and snow, you are always responding to the subtle changes within your body, refining and rebalancing with every breath you take. Breathe into it, soften, let go and you will begin to find your inner balance. Feeling strong, stable and balanced.